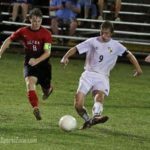 The 2017 Missouri Class Boys Soccer All-Region – Southwest and Central Team has been announced. Recognition for Conference, Regional and State awards is done by members of the Missouri State High School Soccer Coaches Association (MHSSCA). Made up of Districts 9-12, the Kickapoo Chiefs finished fourth at State. Nixa, Smith-Cotton and Lee’s Summit were the other District champions in the Region.